← Bougainville Development News: Why does Bougainville constantly have “systems down” and blackouts ? Bougainville News: Is the AB government ‘too concerned with mining and neglecting our agriculture’? “Since the cocoa had been introduced to Bougainville, there is no millionaire in the cocoa industry, the local farmers are just sweating their guts making money for other big companies like Agmark, Monpi and others, We have been working for our bread and butter with no such improvements to date. The cocoa industry, which used to be among the backbone of rural economy, was grounded to a halt after a nine year conflict. A project is helping to grow back cocoa production by providing better seedlings, training and tools. COCOA was introduced in Papua New Guinea even before coffee was introduced to the Highlands of PNG but it did not get the help and attention it deserves, a Bougainvillean cocoa grower says. Simeon Karena, once a subsistence farmer of Doreinang area in the South Nasioi Constituency of Kieta District, expressed his concern that cocoa had not made the locals become wealthy as opposed to coffee in the Highlands. “Coffee has downstream processing centres at the local level but for cocoa, I’m still waiting for that quality chocolate to be processed here in the region but no such improvements have been made to help local cocoa farmers process cocoa right at home,” Mr Karena said. Mr Karena said farmers in the New Guinea islands must improve their cocoa beans and produce chocolate or other products in the region. “Since the cocoa had been introduced to Bougainville, there is no millionaire in the cocoa industry, the local farmers are just sweating their guts making money for other big companies like Agmark, Monpi and others,” said Mr Karena. “We have been working for our bread and butter with no such improvements to date. He called for the revival of that Bougainville flavour which was once one of the top cocoa flavours in the world market. Mr Karena said the government is so concerned about the mineral sector and has relegated agriculture to the back burner. Mr Karena said the blame must be squarely labeled at the government’s failure because since the end of the Bougainville crisis, the government had no resource people such as the agriculture extension officers working with local farmers. “In the past the government had such officers who helped the local farmers to produce high quality cocoa beans and farming products. “Now we have a drop in prices of cocoa. Doesn’t the Government have control over that?” asked Mr Karena. He said the government is here for such downfalls but it is not doing what it should to help farmers. Increase in price will motivate the local farmers and that’s what I have seen, he said. He said mineral wealth will not be the future of PNG and called once again for a shift in government policy. Bougainville, Papua New Guinea, September 17, 2014 – In the 1980s, Bougainville produced the most cocoa of any province in Papua New Guinea. Alongside copra, this was the backbone of a thriving rural economy, and it provided critical income for thousands of people. But from 1989, Bougainville was to experience a devastating nine year conflict. The economic impacts were crippling. Industry was decimated; villagers were unable to access their land or markets – and production of cocoa and copra grounded to a halt. After a limited revival, the cocoa industry has stagnated: aging trees mean poor yields, and cocoa pod borer (CPB) has ravaged remaining crops. Cocoa production in Bougainville fell by more than 41% from 2009, to reach its lowest level since the crisis. The highland areas of Tinputz, on the east coast of Bougainville, are known for their fertile soils, and were once a hub for agriculture in Bougainville. David Vaorete, from the village of Namatoa, has watched the community’s cocoa gardens turn to jungle. He says that the younger generation now lack the skills and knowledge to take cocoa production forward. During the conflict, many young people were killed in the fighting. Many more grew up away from their land. Now, David is involved in implementing a new program, the Productive Partnerships in Agriculture Project (PPAP). Supported by the World Bank, International Fund for Agricultural Development and the European Union, it engages farmer groups and the cocoa industry to help rejuvenate growers’ gardens. Several lead partners—including exporters; NGOs or grower cooperatives—have been recruited by the project to help farmers revive cocoa production. As part of this project, David chairs the Namatoa village nursery, which is growing and distributing hundreds of new cocoa plants to participating farmers. These seedlings are hybrid clones, specially grown to be more resistant to CPB. The trees are shorter and easier to manage, and they are relatively quick to bear fruit. He is also working with schools to develop skills and interest among young people. Farmers are further supported with training, crop diversification activities and tools provided by lead partners. Where the new cocoa varieties have been planted, growers are already seeing a big difference in the amount of cocoa they can harvest, which is translating into higher incomes for their families. With good management, growers can eliminate as much as 98% of CPB infestation and bring it firmly under control. Maristella Sira is a farmer in Tinputz and she has received training, seedlings and tools through a PPAP-initiated partnership with Monpi Cocoa Exports. “I think we have produced over a 100 bags – we’ve seen an increase. With the additional income, I’ve been able to build a new house, buy a new water tank, a lawn mower and other household tools,” says Maristella. For David, Maristella’s story is not surprising, and explains growing interest in cocoa among villagers. He sees cocoa as key to restoring economic vibrancy to Tinputz. Earlier this year the World Bank Board approved an additional $30 million to expand PPAP, aimed to double coffee and cocoa production, and increase income for an estimated 60,000 smallholder farmers. The European Union has recently contributed an additional EUR5 million, and IFAD will soon add $22 million of financing to further increase these benefits. This year is the first that farmers are really seeing the impact of the project. In the cocoa sector alone, as of May 2014, nearly a million trees have been rehabilitated or planted, to benefit thousands of smallholder cocoa farmers and their families. For Papua New Guinea’s cocoa industry, this is merely the beginning. 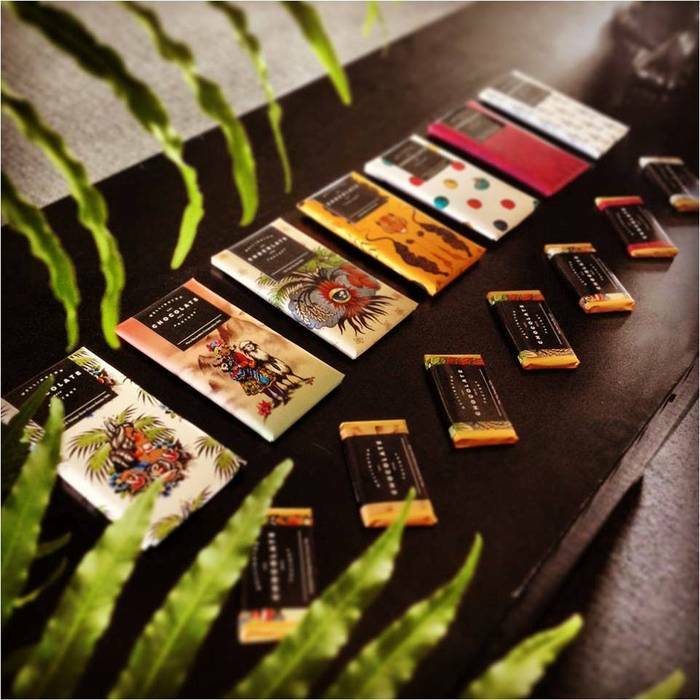 Like many others, David believes there is huge potential for Bougainville-origin chocolate on the global market. It is a product which is granted coveted “fine flavor” status; the industry also stands to benefit from its proximity to Asian grinders in Singapore, Indonesia and Malaysia – countries which are now buying as much as 46% of PNG’s cocoa.